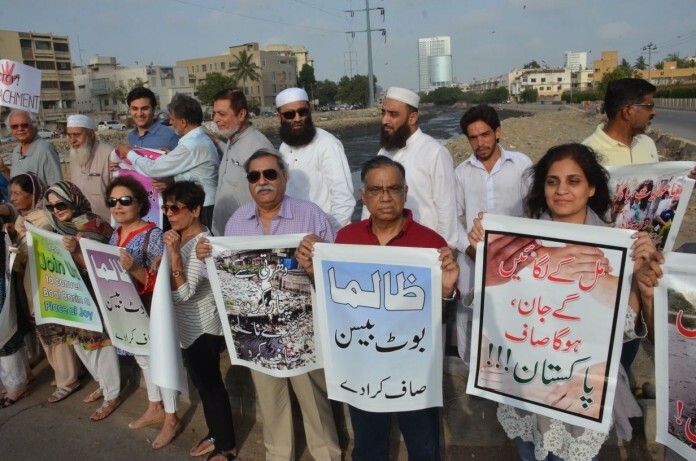 KARACHI: () Members Of Civil society and business community (members of FPCCI) activists belonging to Clifton area held a demonstration to protest against the dirty smell from sewerage and filthy condition of “Nehr-e-Khayyam”, now known as Ganda Nala. 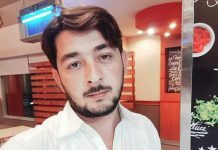 The residents including large number of women, businessmen, general public and children of Clifton block five near Boat Basin came out of their houses and chanted slogans demanding immediate action for cleaning the Nehr-e-Khayyam, Ganda Nala. The protesters were holding banners and placards inscribed with demands for removing encroachments and early action by Karachi water and Sewerage Board and Clifton Cantonment to clean the drainage. 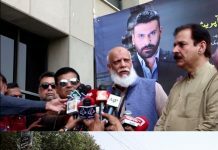 Speaking on the occasion Vice President of The Federation of Pakistan Chambers of Commerce and Industry (FPCCI), Tariq Haleem said that 180 ft wide canal Nehr-e-Khayyam is now reduced to 90 ft due to negligence of concerned authorities and now they are also uninterested to clean it up. He said it has become impossible for the residents of the area to live here due to unbearable smell and filthy state of the canal. Tariq Haleem also stated that FPCCI with all its strength has come out in support of this project to clean out the Nehr-e-Khayyam. We at ‘FPCCI’ feel that it is high time that Karachi which is the city of lights is restored to its past glory. Karachi is not just a city, but it is “the heart of Pakistan”. Former Chief Secretary Sindh, Aslam Sanjrani said that the city has been destroyed and all the open space has been encroached. 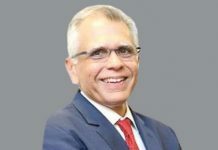 He said that about 15 Architects including Shahid Abdullah who are some of the best in Karachi have also prepared a plan for the Nehr-e-Khayyam and urged the Chief Minster Sindh to approve and support the plan for the betterment of the public. He also appealed to the Chief Justice of Pakistan to take appropriate notice / measures in this regard. Mrs. Seema Ahmed, Nadia Humayun, and Shafqat Elahi who are one of the main initiators of this project had made out slogans like “Sirf Baatain Karna Choro”, “Amal Par Dihan Do” and “Zalima Boat Basin Saaf Karade”. Prominent Industrialists including Dr Mirza Ikhtayar Baig said that a few years back this area was counted as one of the most beautiful areas of the city and people preferred to reside in this area. Now people dislike even to visit the area.